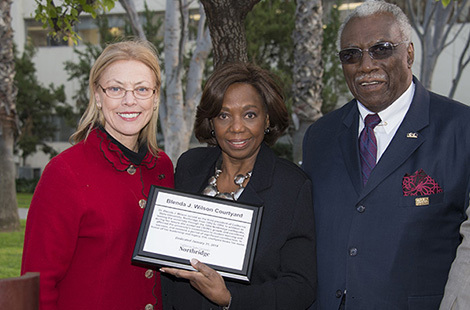 CSUN President Dianne F. Harrison was joined by faculty, staff, alumni and community leaders in celebrating the legacy of former CSUN President Blenda J. Wilson. Read more about the dedication ceremony. Separating twins in kindergarten, a common practice in schools across the country, can be traumatic for children, according to CSUN education professor Lynn Melby Gordon. Read more about the study. Although they hail from opposite sides of the political aisle, Michael Dukakis and Linda Lingle shared remarkably similar perspectives on public service and policy making. Read more about the event. Join us as we learn from sports professionals in the science/medical field about their career paths, current trends, and the future of the science of sports. Join your fellow CSU alumni for an evening of networking at the exclusive University Club of New York. CSU Chancellor Timothy P. White and CSUN President Dianne F. Harrison will also be in attendance. CSUN launches the 2014 Senior Class Gift Campaign, which provides this year’s graduating students an opportunity to establish a legacy at the university long after they’ve stowed away their caps and gowns.